New Years: Beginning on the right food! (I meant to type foot, but fancy that error). Rosh Hashanah and Yom Kippur are now in our past, and I’m ready to get back on track with my raw-some life. Not to say my life has been un-rawsome, however I have found myself eating foods I am not accustomed to. (Like chicken, lamb, and even an occasion beef intake). I am not one to say I am anti-meat, however I am very aware of the difference eating these foods makes in my life. I lose a bit of my life force and vitality. As is well known, I am in Israel, and the healthy food choices I became so accustomed to in Denver, are not as present here. Boy do I miss Whole Foods Market. Especially their coconut water. Coconut water just doesn’t exist here. Anyway, I have had the hardest time finding almond butter in the north, but this week I spent Yom Kippur in Jerusalem and was able to pay a visit to a health food store near the shuk. At this store I found almond butter, cacao, carob powder, and spirulina! Gosh am I happy! And I can no longer make excuses for not having the food I want. I was in fact blaming it all on the fact that I did not have almond butter. Now that I am back home, in Shlomi, I made my first raw breakfast. My recipes from here on out will be simple recipes, because I do not have a blender or my dehydrator. So for all of you who tell me you don’t have the time or proper tools, you no longer have an excuse. (I won’t go into the “not having time excuse,” because the true matter is how you choose to use your time. All we have is time). Rolled oats, almond butter, honey, carob, cacao, raisins, peaches. In a bowl, mix almond butter, honey, banana, carob and cacao together. Add oats, and raisins and mix well. Massage the ingredients together, and give it your love! 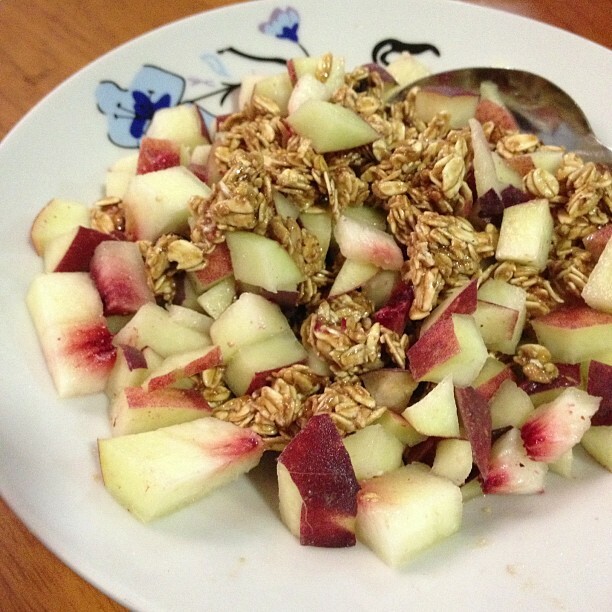 Add additional fruit to your granola and enjoy! Feel free to add an alternative milk, and make this a smoother cereal!